With the outbreak of war on December 7, 1941, local authorities and the F.B.I. began to round up first generation Japanese Americans (Issei) in Hawaii and on the mainland. By 6:30 a.m. the following morning, 736 were in custody. Within 48 hours, the number was 1,291. Caught by surprise, these men were not held under formal charges and family members were forbidden to see them. Most spent the war years in enemy alien internment camps run by the Justice Department. On February 19, 1942, President Franklin D. Roosevelt signed Executive Order 9066 that allowed military authorities to exclude any group of people from any region without trial or hearings for reasons of "military necessity." E.O. 9066 provided the legal authority behind the mass removal of Japanese Americans from the West Coast. On February 25th, the Navy informed Japanese American residents of Terminal Island near Los Angeles Harbor that they must leave in 48 hours. This group was the first to be removed en masse and suffered especially heavy losses as a result. On March 18, 1942, the War Relocation Authority (WRA) was created, and on March 24th, the first of 108 "Civilian Exclusion Orders" was issued. These orders informed Japanese Americans of Bainbridge Island, Washington that they had to leave. For the rest of the spring, through the summer, and into the fall, Japanese Americans up and down the West Coast were removed neighborhood by neighborhood through these "exclusion orders." 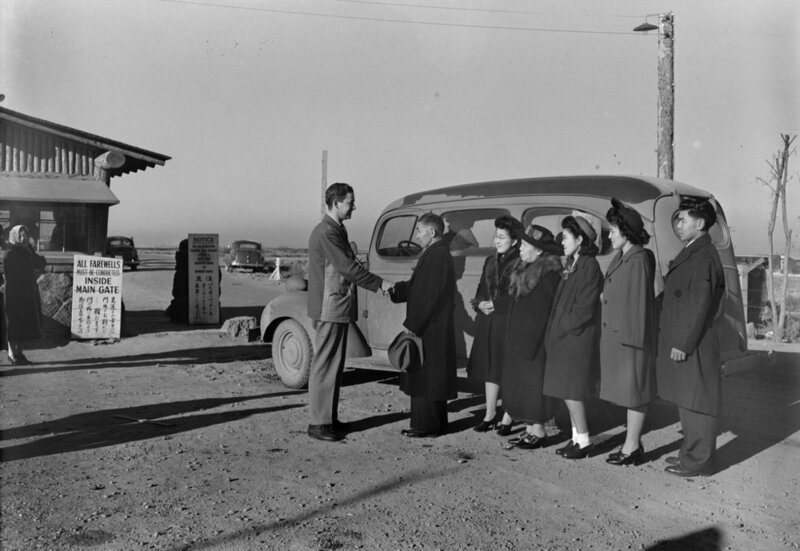 Most Japanese Americans were taken to a local "assembly center," or temporary detention facilities, upon arrival. The first "volunteers" arrived at Poston, Arizona (Colorado River), on May 8, 1942. This location was one of ten "relocation centers" which housed Japanese Americans during the war years. Through the rest of the summer, Japanese Americans were transferred from the temporary detention centers to Manzanar and Tule Lake, California; Amache, Colorado; Minidoka, Idaho; Topaz, Utah; Heart Mountain, Wyoming; Rohwer and Jerome, Arkansas; and Gila River, Arizona. These were America's concentration camps. The so-called "permanent" camps were hastily constructed and initially offered few amenities. Testifying before the Senate Appropriations Committee, Milton Eisenhower said, "[The construction] is so very cheap that, frankly, if it stands up for the duration, we are going to be lucky." Life for many in the camps was difficult. Residents were able to bring few belongings, had to "make do" and often made furniture from construction scraps and mattresses from straw. In all, 120,313 people were under WRA control. 90,491 were transferred from temporary detention facilities; 17,491 were taken directly from their homes; 5,918 were born to imprisoned parents; 1,735 were transferred from INS internment camps; 1,579 were moved after being sent from assembly centers to work crops; 1,275 were transferred from penal and medial institutions; 1,118 were taken from Hawaii; and 219, mostly non-Japanese spouses, entered voluntarily. Of these 120,313 internees, 54,127 returned to the West Coast after their incarceration; 52,798 relocated to the interior; 4,724 moved (or were moved) to Japan; 3,121 were sent to INS internment camps; 2,355 joined the armed forces; 1,862 died during imprisonment; 1,322 were sent to institutions; and 4 were classified as "unauthorized departures."